Med start måndag 20 april kommer Socialantropologiska institutionen att gästas av professor Thomas Fillitz, Department of Social and Cultural Anthropology, University of Vienna. Thomas Fillitz kommer dels leda masterkursen ”Approaches to the Contemporary Anthropology of Art”, dels ge seminariet ”Anthropology, Biennials, and the Concept of Global Art”. Inom ramen för Creole-programmet kommer Thomas Fillitz att ge kursen ”Approaches to the Contemporary Anthropology of Art”; en intensivkurs på avancerad nivå. Kursen fokuserar på ett antal ämnen i samtida konstforskning: konstteori, konsthistoria, konstantropologi, etc. National University of Ireland-Maynooth (Irland). Måndagen den 20 april kl. 13.00 i B600 håller Thomas Fillitz forskarseminariet ”Anthropology, Biennials, and the Concept of Global Art”. Two major interrelated topics have determined my research foci in the last years: my ethnographic interest in the art biennial of Dakar, Dak’Art, and more theoretically, discourses on the concept of global art and problems related to it. I consider that discussion within the framework of the concept of global art which was elaborated by several art historians and theoricians. With this concept, they refer to the changes which can be witnessed nowadays, and which call for new approaches and concepts (such as the one of art world). Scholars in the anthropology of art, however, have by and large not participated in these latter discussions. I argue that anthropological approaches are central to the concept of global art. This relates not only to present-day developments of methods of ethnographic field research (multi-sited ethnography resp. strategically single-sited ethnography, George Marcus 1994). Advocates of the concept of global art firstly rely on theories of an anthropology of contemporaneity (e.g. 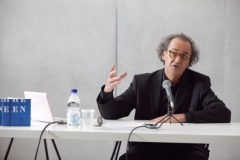 Marc Augé 1994), and secondly also claim the need to study contemporary art locally with its regional and global connections. Ta del av hela seminarieserien. Läs mer om Thomas Fillitz forskning.